Francien, our daughters and I embarked on the ferry at the pier which was too small for the hundreds of people trying to get to the Koh Rong islands. It was chaos, but eventually all the tourists carrying their backpacks over their shoulders and locals hauling supplies somehow got onto the boats. The sea was calm and after a comfortable 45 minutes we set foot on the beaches of Koh Rong Samloem, a hilly island entirely covered in dense jungle. There are no roads on the island and no connection to the mainland electricity grid. Water and power come on and off, slow Wi-Fi is only available in a few places when the power is on. We mingled among mostly young people from Europe and Australia who stayed in hostels, budget guesthouses, dorms, tents and basic chalets. On the beaches there were beans bags, hammocks, BBQ’s, and folks jogging, carrying backpacks, wearing tattoos and a few hippy-style long hair. The few tourists arriving with hard-case suitcases and wearing fashionable clothing clearly felt out of place. Makeshift alfresco restaurants provided local and western style food. On the sea, a few long-tail boats provided the only transportation around the island. We stayed in two wooden beach chalets on stilts. The sea breeze blew through the mesh screens in the walls, keeping the air balmy and fresh. In the morning, after serving basic breakfast, our waitress put food on the Buddhist altar in the middle of the eating area. The rest of the day was about swimming in the warm sea water, laying in a comfortable chair reading a book or strolling along the white sandy beaches. I noticed the high pitch voices of the local Khmer people, or were some Chinese....? One afternoon I hiked to the other side of the island across hilly and rocky jungle terrain. I saw butterflies, a few mongoose (blank with white tale) and termite heaps. The vegetation was not as dense as in Malaysia. On one spot I walked close to burning trees, no doubt the locals (illegally??) clearing the forest to replace them with coconut palm trees. On a hill there was an 18-meter-high abandoned lighthouse, built by the French when Cambodia was still a protectorate. The light had been removed a long time ago. I climbed the steel ladder and enjoyed the 360-degree view across the entire island, covered with thick tree canopies, fringed with mangroves and tall palm trees bowing over the beaches. On the horizon across the deep blue sea I saw the mainland from where we would take a plane back to Malaysia the next day. On our way back to the airport, we took the ferry to Sihanoukville. ‘Two years ago this was still a sleepy town.’ a local man said, staring at the coastline as our ferry was approaching the port. ‘They have built 30 casinos and another 40 are being built right now. Prices for food, housing and supplies are going up, we locals cannot effort that anymore!’ shaking his head angrily. This is the only deep-sea port of Cambodia, on the Gulf of Thailand. Sihanoukville creates a new link in the chain of global ports that China has dubbed "the Maritime Silk Road". As part of that global project, the Chinese are constructing a highway to the capital city of Phnom Penh, 250 Km to the north, connecting this port eventually with the mainland China. We stayed one night in a hotel close to the pier. The town is dirty, heaps of trash on many street corners. We strolled through the alleyways wafting with the smell of sewage. Clearly the infrastructure can’t keep up with all the building development. 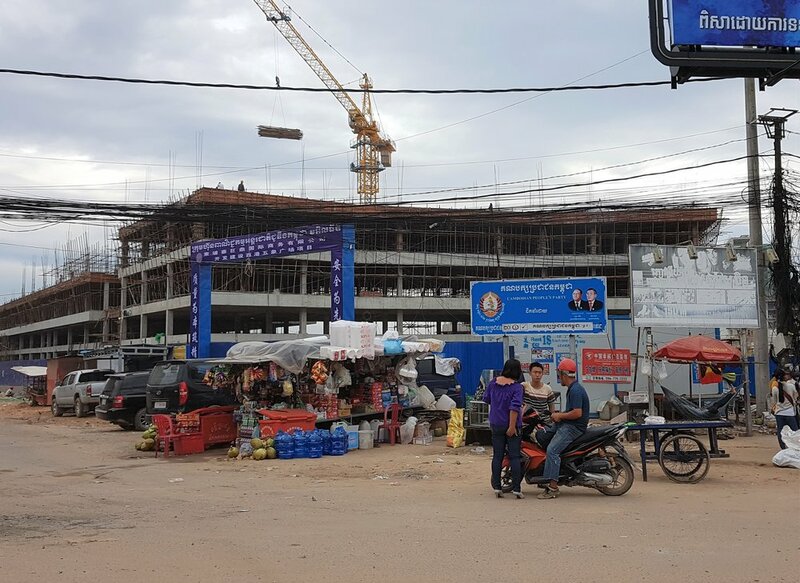 Chinese companies are building factories, condo hotels, box like casinos and high-rise apartment blocks in Sihanoukville. Everywhere we looked, we saw construction going on. Trucks, diggers, earth-movers and cement trucks clog the dusty roads, sometimes not much more than dirt roads. We drove past the Sihanoukville Special Economic Zone, a 4.4-square-mile industrial park where 100 of the 120 companies are Chinese. Chinese supervisors working on casino construction site. More and more Chinese are settling down in the city, taking over existing businesses and setting-up new ones. It is estimated that already 20% of all citizens were Chinese. There is resentment towards the Chinese. The local drivers and staff didn’t take long to tell us that they didn’t like them coming here. ‘They live, work and socialize among themselves, do NOT integrate enough into the local community.’ our taxi driver complained. When we sat on a terrace close to the pier, we heard Chinese men erupting into laughter and yelling, a cue of some bad behavior. Some men seemed to do there what was not allowed back in their home country. They exuded a brash ignorance, failing to respect Cambodians social customs, ways of life and religious culture. This creates even more friction with the locals. In the evening we watched red colored flying Chinese lanterns in the night-sky floating high above the bay, a peaceful contrast to the hectic city life. However, that same night we could barely sleep, because of the noise by the drunk men singing karaoke in the nearby restaurants. The next morning, we reached the tiny airport via a potholed road. We had seen the ugly side of progress, quickly changing the laid-back character of the place. 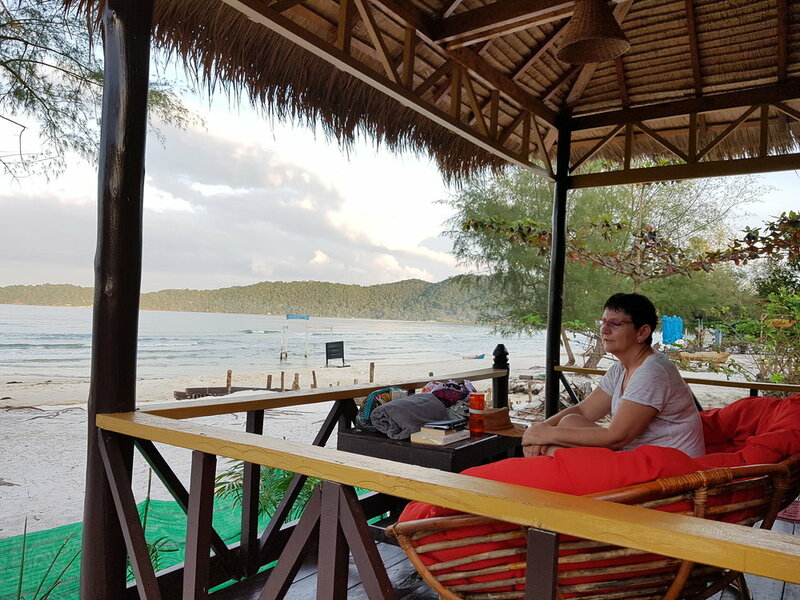 I wondered for how long those backpackers will still be visiting Sihanoukville and Koh Rong Samloem….